Get ready to rock the park! In its 23rd year as the much-anticipated summer tradition, Bank of the West Celebrates America free concert and fireworks show is set for Friday, June 28, 2013 in Omaha’s Memorial Park. Bank of the West will feature a full evening of national musical entertainment followed by a fabulous fireworks finale. 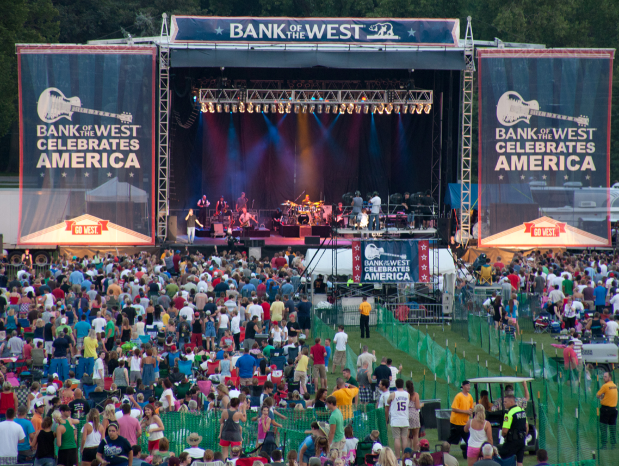 Hosted in cooperation with the City of Omaha, Bank of the West Celebrates America attracts over 50,000 people annually. The musical groups will be announced later this spring. More than 50 nationally acclaimed musical groups have entertained audiences at this summer concert tradition over the past 22 years. “We encourage everyone to join us on Friday, June 28 for the region’s kick off to this year’s Fourth of July festivities,” said Dalrymple.